Telegram users can now bookmark important messages and media by forwarding them to a personal cloud storage area called Saved Messages. Each saved message also has a "go to" button that takes users to the place in the chat where it was originally posted. Saved Messages can be found in the Chats list and in Settings. Each album can include up to 10 photos or videos, arranged in the chat as elegantly proportioned thumbnails. They will also result in one notification instead of ten on the recipient’s side. (1). 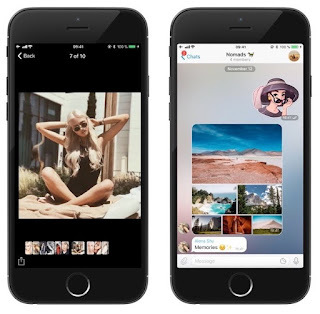 Grouped Photos – Group media into an album when sharing multiple photos and videos. Choose the exact order of media you send. (2). Saved Messages – Bookmark messages by forwarding them to “Saved Messages”. Access them from the Chats list or from the side menu. (3). Better Search – Find bots and public channels faster by typing their titles in Search. Popular bots and channels are shown first. (4). Pinned Messages – If you are a channel admin, pin messages to focus your subscribers’ attention on important announcements. The developers have also improved the global search algorithm used for finding public channels, groups, and bots. It's now possible to search for public channels and bots by their titles, and most popular items will always be displayed first. These features are available for both Android and iOS. Telegram users can now bookmark important messages and media by forwarding them to a personal cloud storage area called Saved Messages. Each saved message also has a "go to" button that takes users to the place in the chat where it was originally posted.